You will be given a Free reference e-book to read which has 1089 pages And the test will be based on that e-book. The Java SCJP certification which stands for Sun certified Java programmer certification is what an individual or professional should earn if they want to possess a strong representation of their indomitable foundation and background about the Java programming language and their competitive skills when it comes to building highly functional and feature-filled programs using the Java technology. It should be noted that the actual exam that a person needs to take to earn the Java SCJP certification covers topics that are related to the core interfaces linked to application programming and are primarily used in designing object-oriented Java applications. It also requires you to obtain a more extensive insight about the specific steps and procedures that you need to follow to establish the most efficient Java applications including those that are primarily used to manipulate files, file systems and directories. You also need to prepare yourself for the exam by undergoing programming exercises and providing the best solutions for each of them. 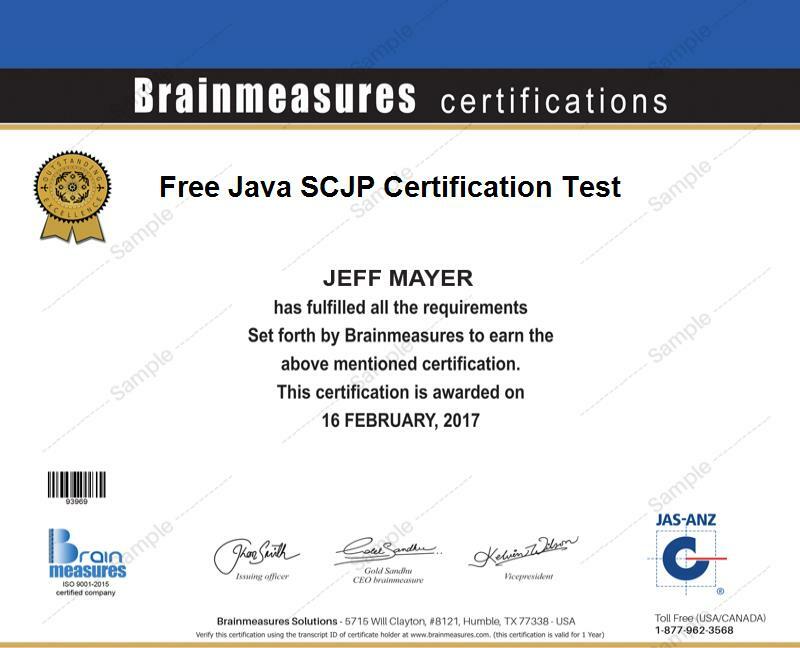 Fortunately, Brainmeasures has already developed a free Java SCJP practice course which comes with a comprehensive study guide essential in your attempt to master all the topics that are usually tackled in the actual certification exam. You can also use the free Java SCJP practice test included in the course as a guide in organizing all the preparations that you need to make so you will have an easier time passing the actual test. The free Java SCJP certification practice course which is offered by a well-known online certification company named Brainmeasures is professionally and expertly developed by real experts in the field and this guarantees you that all the things that you will learn from the course are highly accurate, relevant and updated. This free Java SCJP practice course from Brainmeasures takes pride of its free study guide which is extensive enough that you can expect all the details that you need to learn to become an even more effective Sun certified Java programmer to be clearly explained. It provides the most accurate and relevant information about all the topics and aspects related to Java programming as well as the complexities associated to the field. The well-developed free test included in the practice course will also serve as your guide when it comes to learning the ins and outs of the actual certification examination environment and understanding the most effective techniques that you can use to successfully pass it. How to declare and initialize variables? The free Java SCJP certification practice course introduced by Brainmeasures in the industry is proven to be really useful to hundreds of individuals and professionals who dream of becoming an expert Sun certified Java programmer. This practice course mainly targets those who plan to become certified experts in Java programming including existing and aspiring programmers, developers, engineers, administrators and other IT professionals. You will also enjoy the sudden growth of your salary after you receive your Java SCJP certification. You can actually use your certificate to work as a Java programming consultant and earn at least $70,000 every year. If you decide to work as a certified Java programmer, then your annual salary range can grow higher. This profession will let you enjoy an annual salary between $60,000 and $125,000.